It’s a Friday night in 1946. That usually means going to a movie. But this time, you want to do something new, something different, something modern. You decide to go to the drive-in theater. Outdoor movies! When it gets dark, you can sit in your own car and watch a movie on a giant screen. There’s a speaker phone on a post next to your parking spot. And you only pay a buck to get in, no matter how many people you load into the car. Where do you go? There’s only one drive-in around town, over by Morton Grove there, on Waukegan Road. But there are plans for more of them. Yeah, let’s go! Abbott and Costello are great! The first drive-in theater opened in New Jersey in 1933. Yet they didn’t become popular until after World War II, when people started buying cars. 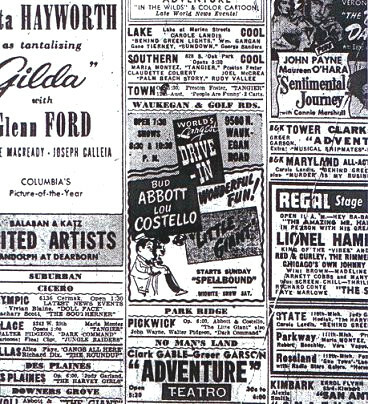 In 1946 there were perhaps 50 drive-ins in the entire country. Ten years later, there were more than 4,000. It was the Baby Boom, and everybody was starting a family. Parents could take the kids with them to the show, and not worry about how much noise the little darlings made. Later, when the kids got to be teens and began driving, they could go to the drive-in on dates, and have some privacy if the movie were boring. At one time there were more than a dozen drive-ins around Chicago. Most were in the suburbs, but they did have one in the city itself, on Columbus Avenue on the Southwest Side. The biggest was the Bel-Air, at 31st and Cicero. They had back-to-back screens and space for 2,500 cars. The Harlem-Irving backed up onto a residential street, and you could easily see the screen from there. That caused big traffic jams when they started showing X-rated films. Times change. In the early ‘80s the drive-ins began closing. The biggest reasons were the VCR and cable TV, which both were becoming popular. Now you could sit at home, watch the movie, and do whatever you used to do at the drive-in. The Waukegan Road drive-in is gone, and the Bel-Air, and the Harlem-Irving, and most of the rest. 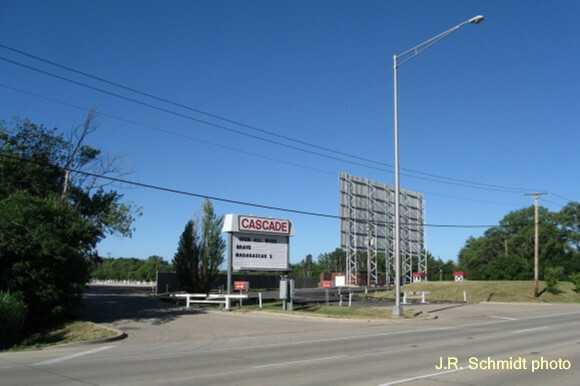 But in West Chicago, the Cascade is still in business.